The federal government is reappointing a special mediator to help end the Canada Post strike and says it will table back-to-work legislation if an agreement isn't reached in the next few days. A statement from the office of Patricia Hajdu, the minister for employment, workforce development and labour, said legislating an end to the dispute would be "a step we do not take lightly." "For nearly a year, we have been supporting and encouraging both sides to reach a negotiated agreement," the statement read. "We provided conciliation officers, appointed mediators, and offered voluntary arbitration. Despite all of this, limited progress was made and we have exhausted our options." Earlier Tuesday a group that represents small and medium-sized Canadian businesses called on the federal government to pass back-to-work legislation to end the Canada Post strike, arguing that two-thirds of their members have been hurt by the dispute. 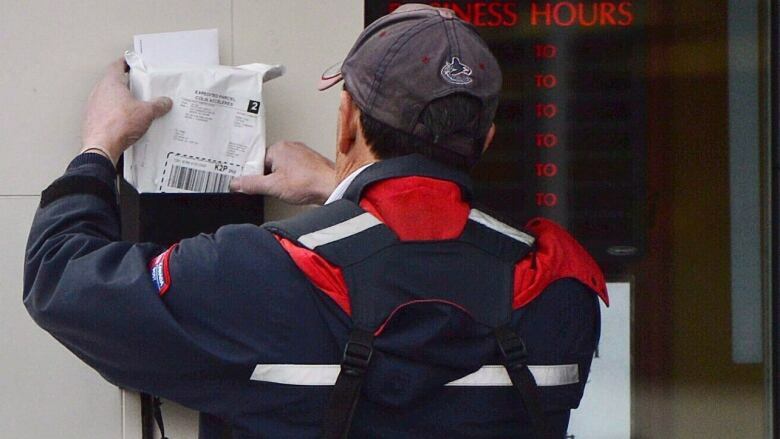 The Canadian Federation of Independent Business has 110,000 members across the country, and the group says on average each one has been hit to the tune of $3,000 by the disruptions to mail and parcel delivery. Canada Post's largest union started rolling strikes across the country in the middle of October, and while the specific shutdowns are moving to new places every day, the aggregate affect has been enough to bring package delivery in particular to a grinding halt. The carrier has already asked foreign mail services to stop sending packages to Canada to add to the backlog, and now says it is too late to get delivery back on track to cover the busy holiday season. "Canada Post is advising commercial customers and Canadians that mail and parcels in or entering its network will have long and unpredictable delays before being delivered," the carrier said Tuesday. That's bad news for small businesses who rely on the mail service to deliver products to customers. Two-thirds of CFIB members say they plan on using the mail service less in the future because of the pain the disruption has caused them, CFIB president Dan Kelly said. Canada Post says there are currently more than 500 truckloads full of undelivered packages sitting idle at various facilities across the country. Many of the items in there originated from small retailers, and Kelly said the lost orders, late payments and the need to shift to more expensive shipping alternatives have already cost the typical member about $3,000. "The rotating strikes have gone on long enough," he said. That's why the group calling on government to pass back to work legislation by week's end, if the two sides can't reach a deal. They may have a sympathetic ear in Ottawa to that request. Speaking to reporters in Ottawa on Wednesday, Prime Minister Justin Trudeau suggested that "all options are on the table" in dealing with the impasse. "Of course, I'm very preoccupied of the fact that Christmas is coming … important shopping days are coming, and we need to see a resolution to that." A day earlier, Labour Minister Patty Hajdu was even more circumspect, when asked about the prospect of the government stepping in. "We've encouraged [both sides] to work together, we've appointed special mediators," she said. "They are not open to voluntary arbitration, so we're reviewing the evidence right now and we'll have more to say in the days to come." Such a move would not be without precedent. In 2011, the Conservative government of then-prime minister Stephen Harper tabled back-to-work legislation when Canada Post locked out its employees.